I look at the history of humanity and I see that humans inherently understand the beauty that can come with losing the people and things that we love. How many of us can claim we haven’t felt the painful sting of true loss in our lives? Of course, none of us can. Even the old monk who has nothing to lose has, at some point in time, lost a teacher or has left a family that meant the world to him. In fact, most of us have recently lost someone (or something) dear to us. It could have been a grandparent, a cat, a job (that you loved), a sibling, or a significant other. Obviously loss comes in varying degrees. We could have lost a great aunt that we happened to get along with well, or we could have lost the person we believed with all of our hearts that we would someday grow old with. Most of you probably had a specific name or a face pop into your head as you were reading this. The memory of that person or thing instantly triggered a pain somewhere inside of us. The more intricately entwined with our soul that person or thing was (or is), the deeper and more astonishing that pain would have been. We’ve all gone through it. The loss of someone unmeasurably important to us. The subsequent days in bed, looking out the window at a landscape that always seems to be dark and rainy. We sit in front of computer screens watching cartoons or scrolling Facebook. We do anything we can instead of facing that pain. We desperately try to escape it, but we can’t. We buy our favourite foods only to realise we have no appetite. We organise a girls’ night only to realise we’re not really in the mood for company or the notion of changing out of our sweat pants. Some of us need to switch to stronger medicine. We binge drink or we get high. We seek out pleasures of the flesh. Some of us chase a feeling – any feeling – other than pain. Some of us are happy just to numb ourselves. Some of us even like a bit of a blend, the numbing of our minds and souls but the good old stimulation of the physical senses. No matter our medicine, we close our hearts to the world. But what happens to our heart when this happens? Where does it go? Some say our pain is the risk we take, and a symptom of loving someone fully and completely. Others claim is it a symptom of loving foolishly, and with crippling dependence on that which we’ve lost. I think of everything I’ve lost in my life and it’s easy to see where the pain comes from. I saw my grandmothers very infrequently, and my dependence on them was extremely limited. The pain of losing them, however, was great. I would say the same of the loss of my favourite dog growing up. That is because the pain of our loss is directly related to how much love we put into a relationship, and how open and vulnerable we allow ourselves to be in order to receive the return of that love. It is in this understanding we can solace in dark times. I’ve said it before, I know very little about this crazy world we’re caught spinning in. I know even less about that blinding force which we call love. In many ways, I’m hopeless when it comes to these things. But I look at the history of humanity and I see that humans inherently understand the beauty that can come with losing the people and things that we love. I think of John Keats, of Dante Alighieri, Andy Warhol, and countless other poets, artists, and writers who used the power of loss in order to create something beautiful. Since the dawn of time, humanity has found ways to turn our losses into our gains. Destruction into construction. Pain into the inherent pleasure of creation. We’ve taken the holes left by loss and we’ve planted and nurtured seeds of beauty in them. The famous Taj Mahal was built by Mughal Emperor Shah Jahan, who was mourning the death of his wife who had died giving birth. [Source: placesunderthesun.com]. Life has many ways of taking those we love from us. Death, break-ups, situations of long distance or bad timing, and many other pressures of life. In this life, loss comes at us from all angles. We should expect for the agents of loss at every turn. We cannot control who, or what, we lose. We cannot control when we lose them. But we can always control how we react to it. As long as we consciously recognise and accept our grief, then it is in our power to limit and indulge in it as we see fit. It seems funny that our natural response to losing something or someone is to sit still. To mourn. To hold our breath. To try and cease existing entirely. On the most simple of levels, mourning a loss is compounding our grief. We add loss to loss. We lose days and weeks. We lose our connection to the world around us, to the people who love us, and – most importantly – we lose the connection to ourselves. If we’ve already lost someone special to us, why lose another moment, or experience, or chance to indulge in life? Why not indulge in that pain as so many creative humans have before us? We can use that powerful energy and turn it into something that serves us rather than something that cripples us. Something that banishes us to the dark corners of the mind. “The People You Love Become Ghosts Inside Of You And Like This You Keep Them Alive.” (2010) by Rob Montgomery: as suggested by its title, this piece of art was inspired by the death of loved ones. For mother time is a huntress who has never hunted a prey she could not track. She always catches her target. And she comes for us all. This is why we need to keep moving forward, because time always moves on without us. We don’t have to get out of bed, but the world keeps spinning. We don’t have to pass the time, but the time will pass us by. Eventually our time will be up, and we will be taken away from those who cherish us. So get out of bed, and put away the tub of Ben and Jerry’s. Turn your loss and your pain into something wonderful. You can turn that loss of your dream job into that European vacation you fantasized about since you first saw photos of Rome. You can transform the death of your brother into a piece of literature that honours and immortalises him for all of time. You turn your loss of innocence into paintings which inspire emotions in people so powerful that it tells your story without using words. You can take getting dumped as a sign it’s time to start fresh and experience the thrill of living in a new city, or country. Loss is a part of opening your heart to the amazing experiences of life. Unfortunately, it is unavoidable. The more fulfilling of a life we live, the more we’ll feel that familiar pain of loss. That pain is ours. We can run from it, or we can turn it into something that lifts the soul to the higher realms of creation. It takes courage, but I promise you have that courage inside of you. What’s your choice going to be? Don’t we think it’s a little strange that, in a world of nearly seven and a half billion (7 383 900 000) people, so many of us feel like we’re all alone? I’ve always found the term “social media” to be a curious one. Admittedly, if you break the word down into its respective body parts – “social” and “media” – it’s a word that makes perfect sense. Yet it’s not its pieces that make it a puzzle. The term feels like a misnomer. It doesn’t feel right. I look at social media and I fail to see anything social about it. Media is not an inherently social entity. From newspapers to Fox News, there is no social interaction actually involved. We may feel as though we’re socially interacting. Like we’re connecting with that horoscope columnist who just really seems to “get” us, or the newscaster covering our sports team who seems to always agree with our opinion of the new head coach. 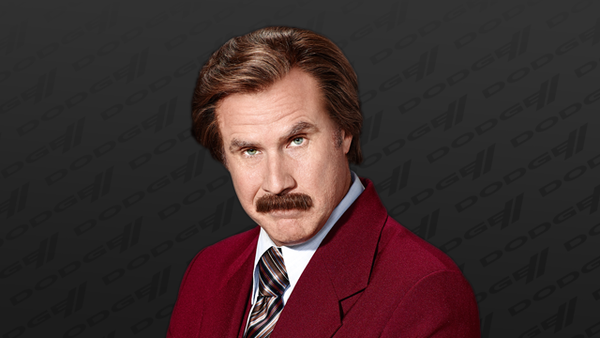 Ron Burgundy: One of the Only News Anchors to Truly Understand Us, San Francisco. We’re still sitting alone at the kitchen table, keeping our eyes on the newspaper while we hurriedly force down the coffee we burnt before work. We’re still messily finishing that crossword on the train with the stranger in a brown suit next to us as our only companion. And no, it doesn’t count as social interaction because we asked him for a four-lettered word for a famous son of Chronos. The media doesn’t want to interact with us. It wants us to read, to listen, and to watch their version of what’s happening all around you. It wants to tell us what perception of reality to accept. Social media, in turn, has taken us one slippery step further down this path of human isolation. Social media has stolen from us our innate love of society; we have never been more antisocial than we are this very moment. There was a time, before bullet trains and water spraying jet packs (which are pretty awesome for the record), when our nearest neighbours were fifteen kilometres away and the fastest method of travelling was on horseback. Yet we called on each other weekly, if not daily, to fulfil that natural desire to truly interact with other human beings. Man is by nature a social animal; an individual who is unsocial naturally and not accidentally is either beneath our notice or more than human. Society is something that precedes the individual. Anyone who either cannot lead the common life or is so self-sufficient as not to need to, and therefore does not partake of society, is either a beast or a god.” – Aristotle, The Politics. Fast forward to today, and I haven’t called on my neighbour since before the first Jurassic Park movie came out. Social media has negatively affected every (formerly) social activity. I see us capturing moments – beautiful sunrises and breathtaking full moons – through Instagram filters instead of capturing them with our eyes and keeping them in our souls. We write those moments as Snapchat stories instead of writing them across our hearts, as part of our own stories that are constantly unfolding. We use the check in button on Facebook to let our friends know where we are and what we’re doing, instead of checking in with a call or catching up with a visit. We’ve mastered messaging with “abreeves” but forgotten how to carry a face-to-face conversation. We live tweet sports events from our couch instead of taking a road trip to catch a live sporting event with some friends. We text acquaintances while we sit around a table with our actual friends. We don’t notice the love of our life next to us in the cafe because our eyes are down on our phone as we try to find love on Tinder. They walk in and out of our lives while we’re swiping right and left. And yet, don’t we think it’s a little strange that, in a world of nearly seven and a half billion (7 383 900 000) people, so many of us feel like we’re alone? It’s because we are alone. Every social media platform offers an additional layer to a wall we’re building between ourselves and those around us. Another filter. More paint on our masks. We’re given the means to limit and skew the images of ourselves that we put out there, and everyone else is doing the same. It becomes a terrifying idea to show people who we really are, so we don’t. Everyone tries to be like everyone else. We’re creating a world where no one will truly know anyone. I think that’s a tragic thing, because the greatest protectors of the beautiful uniqueness and natural individuality we possess as humans should be all of us, together. Governments and, further back, religions have always feared and denounced the individual; the threat to the status quo. And yet, individuals such as Copernicus, da Vinci, Tesla, Picasso, and Einstein did amazing things by questioning that same status quo, by letting their unique thoughts and feelings be their compass. They didn’t follow tradition, and we celebrated them for it. 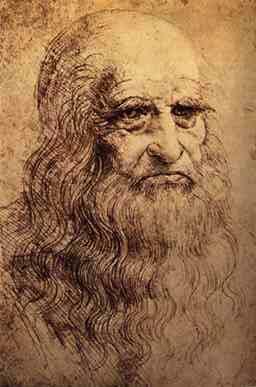 Self-Portrait (1512) by Leonardo da Vinci. I’m afraid we’re starting to lose that. We’re falling into line. Not because of fear or oppression – those things could never break our powerful spirit – but because of distraction. The irony of it all is that I’m communicating this via an outlet that was only born in the age of social media, and sharing it on multiple social media platforms. I think our advances in technology and our ability to connect with one another is astounding. I’m thankful for Skype, Instagram, and other means of keeping in touch with all of those that I love and miss at home. I just think it’s important that in our quest to be more connected, we don’t severe our connection to each other; that we don’t become the snake that eats its own tail. Recognize each other. Appreciate someone when they do something differently, wear something strange, or embrace their authentic self in any way at all. You’ll find people start encouraging you to do the same. And, my God, that will be a beautiful thing. In those days I wasn’t sure what ensued in her bed chambers afterwards, but I knew it represented the climax – no pun intended – of the romance. The moon showed but a silver sliver of its full self. Laying in bed, I waited patiently for the Cheshire Cat to open his eyes and reveal himself in the night sky. He never did. Still, there was something in the way that celestial scimitar was standing triumphantly in the cloudless sky that inspired a deep feeling of romance inside of me as I remained caught in its gaze. Romance, I thought with a bit of a laugh. What is Romance? 1. a feeling of excitement and mystery associated with love. 2. a quality or feeling of mystery, excitement, and remoteness from everyday life. Growing up as one of the many young Romeos, all of us chasing the collective Juliet, I thought I conformed to a pretty standard notion of romance. It seemed pretty simple in those days. The boy bought (or stole from the neighbour’s garden) flowers, and then professed his love from beneath some sort of balcony. If he was a particularly adept romantic, he would do this by means of a sonnet. (2) Was satisfied with the romantic gesture and let her hair down for the young man to climb up. Sure, I might have gotten a few different love stories mixed up at that age, but I had the gist of it. In those days, I wasn’t sure what ensued in her bed chambers afterwards, but I knew it represented the climax – no pun intended – of the romance. As I grew older I began to realize that my vision of what was romantic might not exactly capture the essence of romance. For one, my sisters began to give me an inkling that a truck load of chocolate might better serve a romance than any type of flowers – unless they were chocolate covered and edible. For two, I started to wonder what was in that “happily ever after” that always occurred after the curtains were drawn. We didn’t realize it then, but everything we watched or read during our youth emphasized the beginning of a love story as what should be considered romantic. Whether it was about new love birds or an old couple breaking apart before rekindling an old flame, the romance always lay in the chase; it was the pursuit that was romantic. It was always about that opening gambit and a few initial speed bumps before both prince and princess were ready for that royal wedding. Then the credits rolled. Even now I think of the happy couple, rosy-cheeked in their romantic infancy, reciting the story of how they met for an audience of half-interested single people. It often runs along the same lines. Initially, the female wasn’t interested but the male romantically wooed her into changing her mind. We cover our hearts and say “aw” when we hear of the cheesy and “romantic” gestures that helped to sway the odds in this particular Romero’s favour. There’s not much to say after the “how we met” stories concludes; they are in the middle of their happily ever after. The movie is usually over by now. Babies start coming, fights start happening, and a divorce will probably be the result. The spark has faded. The spark that, we’ve been taught, represents the romance. Of course if we see romance – and by an extension, love – in this way, we’re doomed to a never-ending cycle of needing the hunt. Like freezing Neanderthals in the winter, our lives will be spent focusing on chasing the spark, never enjoying the fire we’ve already set ablaze. Is that really what romance is? I look around me and I see that isn’t true. I see romance everywhere I look. It floats on the breeze that swirls around the elderly couple walking hand in hand in the park. At the arrivals gate in the airport, it swims in the teary-eyes of two lovers locked in an embrace. When two people are separated by an ocean, romance twinkles in the stars they look upon while thinking about each other. It’s in coming home to that familiar face after a long day’s work. It’s in missing someone, even if you just dropped them off. It’s in the strange way you can be overwhelmed with frustration but still love that person with all of your heart. Romance lives in forgiveness, and understanding, after arguments both big and small. It’s in the first handful of dirt a widower throws on his wife’s coffin. It’s found in the breast pocket of a dead soldier, in the recently dried ink of a letter home to his high school sweet heart. When we’re a shoulder to cry on, romance is that little wet patch of tears they leave on our sweater. When we’re the ones crying, romance is the familiar smell of perfume or cologne that we inhale as we bury our face in their clothes. The sorrow of lovers parted before they met, laments over promises betrayed, long lonely nights spent sleepless until dawn, pining thoughts for some far place, a woman left sighing over past love in her tumbledown abode – it is these, surely, that embody the romance of love.” – Yoshida Kenkō, A Cup of Sake Beneath the Cherry Trees. Not one of us will ever master love, or understand it. That is why everything about love is exciting and mysterious. As such, there is romance in all of it. We just need to move past our Hollywood conception of it and start enjoying the little things. Love isn’t perfect, and neither are we. Our happiest and most exciting moments with our significant others will lay perilously close to the saddest and most dull ones. It’s all part of it, it’s up to us to appreciate each moment to the very last. There are little Romeos and Juliets in each of us. We are all romantics. We just need to embrace the romance that’s all around us. Why you have nothing to lose finding and walking your own path. For all of you none-sports fans out there, I promise the greater message behind this short story is worth the wait. So, bear with me! At some point last year, I had just finished watching the Chicago Blackhawks knock out James Neal and his Nashville Predators in game six of their first-round NHL play-off series. It was one of the most exhilarating play-off series I’ve seen in a very long time. It was full of goals, hits, skill, clutch plays, over-times, heroes, villains, and drama. In short, it was everything that sports fans watches hockey for. When the game ended, Chicago being victorious, I couldn’t explain why I felt a deep sense of injustice inside of myself. That injustice followed me around all day, a looming shadow constantly nipping at my heels. Why was I so rattled over the result of a game? It bothered me until I was forced to stop and face the feeling in an attempt to understand it. I wanted to sit with the emotion in the hope that eventually I would let it go. Catch and release. On the surface, the source of that feeling seemed fairly obvious. Nashville had done everything that every young player is taught would result in their success on the ice. Not only had they done everything right, but they had done it better than Chicago. And yet there they were, eliminated from the play-offs. I felt as though something had been taken from Nashville. Like they deserved better. But why? The more I took a deeper look at this feelings, the more I began to realize the root of the problem wasn’t specific to sports. It’s something we all deal with, every day, a humans. In this particular instance, my negative feelings lay in a strange idea of hockey “justice” that had been indoctrinated into me at a young age. As athletes, we are taught to place all of our faith into the notion that if you play the game a certain positive way, a specific positive result will follow. The problem with investing so much faith into this belief is that in sports, as in life, there is no actual guarantee of that desired result. In life, we’re faced with these false promises every day of our lives. If we just follow these simple academic guidelines, we will get into a good university and find a respectable job. If we just master these certain athletic skills and systems, we will soon be playing in the big leagues. If we find a beautiful or handsome spouse, own a white picket fence, a family dog, two new cars in the garage, and make six figures, we will find happiness. If we act in this holy manner, we will go to heaven when we die. Most of the time it is either implied, or explicitly stated, that not following these guidelines will lead to the opposite result. We will fail out of school, get cut from the team, be unhappy in life, or burn in hell. I think that these inferences hold merit on a basic level. If you refuse to attempt a mastery of your athletic skills, you probably won’t make the show. If you refuse to dedicate yourself to reading and writing, your academic pursuits will definitely be more difficult. I think basic instructions on the improvement of dream-specific tools serve as strong groundwork for anyone pursuing those dreams. There are certain things you can’t ignore while chasing your dreams. Things like hard work, passion, and sincerity will always be crucial to your success. So why do I think our “How we should do things” sense of justice is such a potentially dangerous set of beliefs to put our faith into? Because we ignore the possibility that a team like Nashville can follow the age-old formula, preached by hockey clergyman, and still lose the game. We ignore the possibility that we can obtain that corner office and own the dream house in the suburbs and still be unhappy. We can experience hell on earth even if we are morally good people. We can have a chiseled six-pack and still be unhealthy, or unable to truly love ourselves. We ignore the possibility that we can wake up at twenty nine years old in peak physical condition, be highly skilled, but still be in the minor leagues. It is in our ignorance of these very real possibilities that we create very real suffering for ourselves. We see life as unfair or unjust. We’re shocked and appalled when these negative possibilities come to fruition. We waste years pursuing something because someone else told us it will bring us joy. Then we feel as though life isn’t fair when that joy doesn’t magically appear. In cases where one acts correctly but still suffers disaster, one is left bewildered and unable to fit the event into a scheme of justice. The world seems absurd.” – Seneca the Younger, as quoted in The Consolations of Philosophy by Alain De Botton. This may seem like a negative perspective, but it’s not. I believe that understanding these very real negative possibilities gives us – as human beings – real strength. If you can fail by following the rules then you can succeed without fanatically following them. There are no rules. Only choices. See the world, chase the sun. You can be a respectable person without pursuing a traditionally esteemed occupation. You can publish an influential academic piece without attending Harvard, or topping all of your classes. You can be a great champion without a pedigree or without following the traditional path of your respective sport or discipline. If heaven is your goal, you can still find that stairway if you step outside of the three thousand year old guidelines written in scripture. You can be a happy person without following the status quo or chasing the American dream. I can’t give you a blueprint that guarantees success for your pursuits in life. I can’t tell you the way to happiness. But neither can anyone else. So break the chains of expectation. Free yourself from the prison of how things should be, the shackles of how we should live. Stop wasting time following other people’s blueprint for happiness, achievement, success, or spirituality. Carve the path that calls to you. Follow your dream whether or not convention considers it probable, because convention can’t guarantee you success or failure. All you can do in chasing your sun is keep your feet moving and your eyes on the light. And let come what come may.